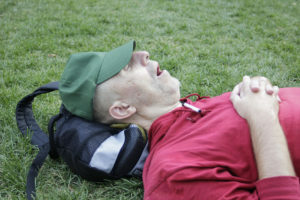 Many people, even in enlightened San Francisco, are unaware about what sleep apnea is and whether they suffer from it, especially those who live alone, because there is no-one to tell them they are snoring. Put simply, when we sleep the muscles in the throat relax. In some people with a narrower airway this means that they snore. However, if the throat closes completely, you stop breathing for a time. Indeed you may stop breathing for more than ten seconds at a time. This can happen dozens of times through the night and it is called Obstructive Sleep Apnea, or OSA. Symptoms include waking up feeling tired, headache in the morning, heartburn, feeling depressed or irritable, poor memory, loss of libido, and difficulty concentrating. OSA can affect your quality of life. It can also cause you to have accidents at work and when driving, and can also lead to high blood pressure, stroke, heart attack, and diabetes. Fortunately there are several surgical options to help with sleep apnea. One procedure involves removing and repositioning excess tissue in the throat which makes the airway wider. The tonsils can be removed and some of the muscles of the soft palate repositioned. Your uvula can be trimmed down. Septoplasty can straighten a bent nasal septum. Your tongue can be moved forward in order to open up space for breathing behind it. Part of the back of the tongue can be removed, again making more space behind it. There are several other types of surgery which can also be performed. Our San Francisco-based doctor, Dr Alex Rabinovich is a specialist oral and maxillofacial surgeon. He can help with sleep apnea for San Francisco patients, and is able to perform any of these surgeries for you if you suffer from sleep apnea. He has carried out countless operations over the years to help people with this problem, and he has written a number of professional papers and theses. He is also frequently asked to speak at dental and surgical conventions. If you believe that you may be suffering from sleep apnea you need to make an appointment with Dr Rabinovich in order for him to make his assessment and explain all of the options open to you. Dr Rabinovich offers a free consult to any patient with regards to sleep apnea, so a discussion will cost you nothing. In order to make an appointment just call us on (415) 817-9991 or click on the Contact Us link at the top of the page. This entry was posted in Blog and tagged oral surgeon, San Francisco, San Francisco oral surgeon, Sleep Apnea on October 26, 2016 by Dr Alex Rabinovich.